World champions and EHF EURO 2018 bronze medallists France face Portugal, Lithuania and Romania en route to EHF EURO 2020, while 2016 Olympic champions Denmark play Montenegro, Ukraine and the Faroe Islands as the 2020 qualifiers draw took place in Trondheim on Thursday evening. With the decision to stage the Men's EHF EURO with 24 teams for the first time in 2020, it means that 32 teams, more than ever before, will participate in the EHF EURO 2020 Qualifiers, which will start in October this year and conclude in June 2019. 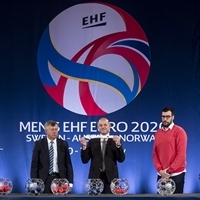 The top-two teams of each group as well as the best four third-ranked teams will qualify for Men's EHF EURO 2020 in Sweden, Austria and Norway. Spain as EHF EURO 2018 champions are, besides the three hosts, also directly qualified. At the same time up to four of the lowest ranked fourth-placed teams will be relegated to the first qualification phase of the Men's EHF EURO 2024. Sweden, Austria and Norway, together with the EHF, have also agreed where certain teams will play in case they qualify. Sweden start their EHF EURO 2020 campaign in group F in Gothenburg. Austria are seeded in group A in Vienna and Norway kick off things in group E in Trondheim. The European Handball Federation is setting a new milestone on the road to the Men's EHF EURO 2020. Starting the last week of October, the three host nations, Sweden, Austria and Norway, together with 2018 champions Spain will play the first matches of the newly introduced EHF EURO Cup. The competition sees the four participating nations facing each other in home and away matches. These matches are always played at the same time as the EHF EURO 2020 Qualifiers and form the participants' - all four are directly qualified to EHF EURO 2020 - very own road to the final tournament. The Men’s EHF EURO 2020 will be played from 10 to 26 January 2020. It is the first to be played with 24 teams and the first to be hosted by three nations. Sweden will organise two preliminary and one main round group plus the final weekend. Venues chosen are Gothenburg’s Scandinavium, the Malmö Arena and the Tele 2 Arena in Stockholm (final weekend only), a 20,000+ capacity stadium. Austria will host two preliminary round groups and one main round group in Wiener Stadthalle and Stadthalle Graz. The 'New Nidarohallen' in Trondheim, which is currently under construction and will seat 8,000 people, is the venue for the two preliminary round groups played in Norway.